set aside. Peel the remaining beetroot, cut into thin matchsticks, put into a small bowl and combine with the white balsamic vinegar, olive oil, and a pinch of salt. In a heavy bottomed pan over a low heat, sauté the onion, celery and garlic in 100g of the butter, adding a little salt until they are translucent, about 5 minutes. Add the rice, saffron, bay leaf and a little more salt. Increase the heat a little, and stir until the rice is sizzling and aromatic, about 2 minutes. Add a couple of ladles of stock, and bring to a simmer, stirring constantly until the liquid is absorbed. Add another ladle of stock, adjusting the heat if necessary to keep the risotto simmering correctly, and keep stirring. Repeat, until the risotto is just al dente, add ½ cup beetroot puree, lemon zest, rosemary and the remaining 20g butter. Season with salt and pepper, add a little more stock (the risotto should be a bit soupy), spoon onto a large warm serving dish, drizzle over saffron extract (about 12 drops), scatter the beetroot julienne on top, and serve with grated Parmesan. If using pumpkin, follow the instructions above for the beetroot, and omit the julienne. Peel and devein prawns, saving heads and shells. Chop prawns roughly, and set aside. Heat 1tbsp oil in a medium saucepan over a medium high heat and cook smashed garlic, stirring until golden, about one minute. Add reserved prawn shells and heads and cook, stirring until pink, about two minutes. Add bay leaf and two cups of water and bring to a boil. Reduce heat and simmer until stock is slightly reduced and flavourful, 8-10 minutes. Strain through a fine sieve into a large bowl and discard solids. This makes approximately 1.5 cups. Heat 2tbsp oil in a large skillet over a medium heat. Add sliced garlic and cook, stirring until fragrant, about one minute. Remove skillet from heat and carefully add tomatoes and 1.5 cups stock (mixture may sputter). Return to heat and cook, stirring occasionally, until sauce is beginning to thicken, about two minutes. Add ‘nduja, working it well into the sauce. Reduce heat and simmer two-three minutes. Stir in clams, cover pan with lid, and cook until they have opened, about two minutes. Remove, and discard any that are still closed. Keep warm. Stir in prawns and cook until opaque, and return clams to pan. Meanwhile, cook fregula in a pot of boiling salted water until al dente. Drain, reserving 1/4 cup of cooking water. Add fregula to the sauce with the chopped parsley and black pepper to taste. Stir in 1/4 cup of cooking water, a big squeeze of lemon juice, and serve in shallow bowls with more lemon and olive oil on the side. Meanwhile, tear the olives in half lengthways, and then in half again. Place in a large bowl. Chop the anchovies into small pieces and mix with the olives, capers, garlic, onion, and celery. Toss in the tomatoes, pour in the olive oil, season with salt and pepper and leave while you cook the pasta in boiling salted water until al dente. Drain pasta, toss with the sauce adding rind and half the lemon juice, and the fresh herbs. Add the courgettes, and gently fold through. Taste for seasoning again, adding more lemon juice if necessary, and serve, scattering the top with the shredded courgette flowers if you have them, and drizzling with the extra olive oil. This is delicious served either hot, or at room temperature. Pour the stock into a saucepan and bring to a simmer. In another large heavy based pan, melt 25g of the butter, add the chopped onion and garlic, and gently cook until soft and golden. Add rice, stir constantly for 2-3 minutes until opaque. Now add the stock a ladleful at a time stirring constantly to prevent rice from sticking. As soon as each ladleful of stock has been absorbed by the rice, add another. Continue until rice is nearly al dente, then add peas, snow peas, sugar snaps, and another ladleful of stock (you may have a little left over). Keep stirring for a minute or two then season with salt and pepper, stir in lemon rind and remaining 25g butter. Serve scattered with the dill chèvre, dill sprigs, and drizzle with olive oil. Put a large pan over a medium high heat, add the butter and let it melt. Add the pork/veal mince, and fry it until it has changed colour. Season with salt and pepper, and cook for 15 minutes longer, stirring frequently, until golden brown, turning the heat down if necessary. Meanwhile, finely chop the onions, celery, carrots and garlic. Put another pan over a medium heat, and pour in 2tbsp olive oil. Fry the vegetables and the herbs until softened, about 12 minutes, adding the extra 1tbsp of olive oil if necessary. Add the meat to the vegetables and mix everything together well. Add the crushed tomatoes, wine, season with salt and pepper and simmer the sauce for 2 hours or until the meat is tender, and of a good sauce consistency (Top up with a little water if necessary). Serve with pasta of your choice, and a decent spoonful of Parmesan cheese. Bring a large pot of water to the boil, throw in a tablespoon of salt, the spaghetti, and cook until al dente. Meanwhile, in a small saucepan, melt half the butter over a low heat. Add cream, half the cheese, grated nutmeg, black pepper and bring it to a simmer turning off the heat as it reaches boiling point. When pasta is cooked, drain, reserving 1/4cup of the cooking water. Return pasta to pot, and over a low heat, add remaining butter and 1tbsp cooking water. Toss pasta to combine, and when every strand is coated, stir in the cream sauce, only adding the remaining water as necessary if the sauce seems too thick. Immediately serve in warm bowls, with the rest of the Parmesan cheese. Bring a large pot of water to the boil, when boiling, add 1tbsp salt, throw in pasta, stir, and cook until al dente. Meanwhile, open tin of tuna and tip contents including olive oil into a large bowl. Add diced celery, and mix, gently breaking the tuna into small pieces. Place anchovies, parsley, and garlic onto a chopping board, and finely chop using a large knife. Add to bowl with zest of lemon, juice, capers, chilli flakes, and freshly ground black pepper. Mix gently. Drain pasta, tip into bowl, and toss with the tuna mixture, adding a decent slurp of olive oil to just coat the pasta. This pasta is also delicious served at room temperature, and leftovers keep well. 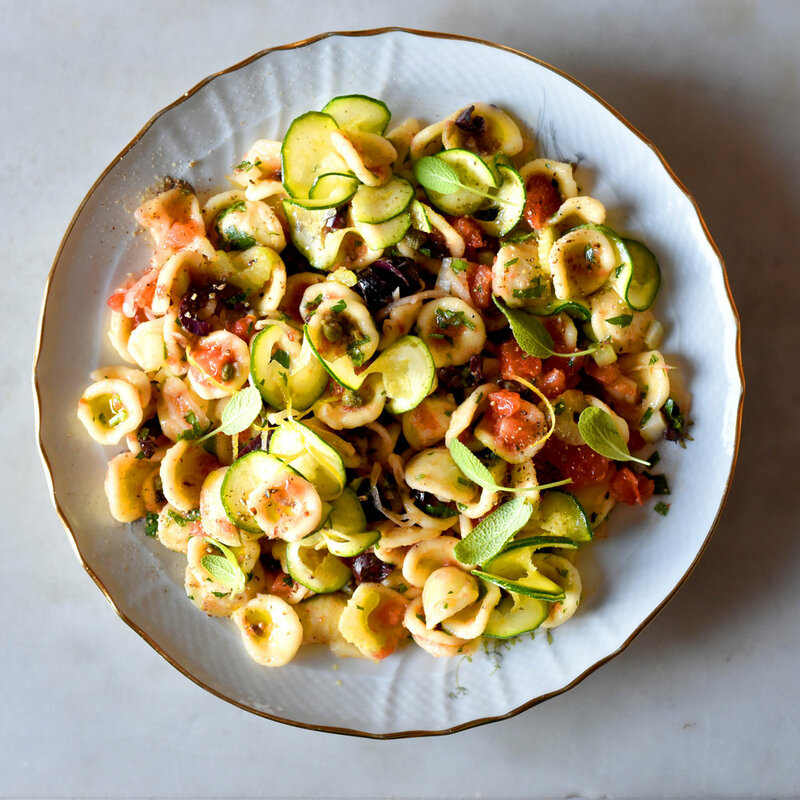 Mix together the olive oil, lemon juice, a pinch each of salt and pepper in a large bowl, and add the zucchini. This will soften, and add flavour to the zucchini while you cook the fusilli. Bring a large pot of salted water to the boil and cook the fusilli until al dente. Drain, and immediately toss with the zucchini. Now gently add the tomatoes, Chèvre, capers, chilli flakes and half of the basil. Spoon onto a platter, season with salt and pepper, and scatter the rest of the basil leaves and the shaved Parmesan on top. Bring a large pot of salted water to the boil and throw in the cavolo nero flowers for just a minute. Take them out with a slotted spoon and put aside. Put the spaghetti into the boiling water, and cook until al dente. Meanwhile, in a mortar and pestle, pound together the ‘Nduja, anchovy fillets and butter. Before draining the pasta, take out ¾ cup cooking water from the pot, and pour ½ cup into the ‘Nduja mix, stirring well to combine. Reserve the rest of the water to use later if necessary. Drain the pasta , return pot to a low heat, add 2 tbsp olive oil and add the garlic. Gently sauté over a low heat for a couple of minutes, add the ‘Nduja mix and simmer for a couple of minutes until slightly reduced. Return flowers and pasta to the pot, tossing until well combined and coated with the sauce. Add the rest of the water if necessary, the lemon juice, black pepper to season, and serve in warm bowls, drizzle with a little olive oil, and add grated Parmesan. Preheat oven to 180C. Line a baking sheet with baking paper, lay the fennel on top, drizzle with a little olive oil, and sprinkle with sea salt and pepper. Put into the oven, and roast for 10-15 minutes. It should just crisp and caramelise, not burn. Take out and set aside. Bring a large pot of water to the boil. Cook pasta until just al dente, drain, reserving about ¼ cup of cooking water. In the pasta pot, melt butter with the cream, and return pasta to the pot with the cooking water. Quickly toss the pasta to coat. Take off heat, add fennel, lemon rind, capers, juice of half a lemon, parsley and salmon. Taste, adding more lemon juice if necessary, and spoon into warm bowls, scatter over Persian feta, season with salt and pepper, and drizzle with olive oil. Serve. Melt half the butter in a large pan over a medium heat. Add the chopped vegetables, bay leaves and cinnamon. Gently cook, covered, for about 10 minutes until the vegetables are soft, but not coloured. Remove the lid, turn up the heat, and add the pork/veal mince. Cook it until it starts to release its juices, breaking it up to prevent it from clumping together, add the mushrooms, and cook until meat and mushrooms start to brown and caramelise. Add a good grating of nutmeg, a decent pinch of chilli flakes, sea salt, pepper, and the tomatoes. After a couple of minutes, pour in the brandy and wine. Stir and scrape up all the sticky bits from the bottom of the pan, and when the wine has reduced a little, pour in 2 cups of stock, reduce the heat to low, and simmer for 1.5 hours. Remove the cinnamon, add the remaining ½ cup stock, remaining butter, and chopped parsley. Simmer for 15 - 30 minutes, check seasonings, and serve with pasta, or polenta. Start by bringing a large pot of salted water to the boil, and rub the inside of your serving bowl with the cut surfaces of the garlic. Now cut up your tomatoes. I didn’t skin them, but as I had a variety of shapes and sizes, I cut the little ones into small pieces and didn’t bother about the seeds. The bigger ones, I cut in half, squeezed out the seeds, and then sliced them up into little pieces. Once done, pop them in the bowl and dress with the olive oil, most of the oregano, salt and pepper and set aside while you cook the pasta. When the water is boiling, throw in your pasta and cook until al dente. Drain well, then tip into the serving bowl and toss quickly through the sauce. Sprinkle with the remaining oregano leaves, and serve with Parmesan if desired. Put a large pan of salted water on to boil. Once boiling, drop in the leek or onion and garlic cloves. Let them cook for 3 minutes then add your kale or cavolo nero and cook for another 31/2 minutes. Using a slotted spoon remove the vegetables to a blender, retaining the water in the pan. Add your olive oil and blend until you have a vivid green purée the same consistency as thick cream, only adding a spoonful of cooking water to thin if necessary. Taste, season with sea salt and freshly ground pepper and put aside. My tomato sauce – you will only need about 2 – 3 tbsp. First, finely chop 1 brown onion, 1 stick of celery and 2 cloves of garlic. Soften over a low heat in about 2 tbsp. butter – not olive oil! This makes the sauce gentler and sweeter which is what I want. When soft, but not brown, add 2 – 3 anchovy fillets. Cook slowly until they melt into the onion mix. You won’t taste the anchovies, they just add a little ‘something’. Add a 400 g tin of crushed tomatoes and 1 fresh bay leaf and slowly cook until the sauce is thick. Season with sea salt flakes and freshly ground pepper, remove bay leaf and puree in food processor. This sauce also works well to enhance other dishes. For example, a beetroot risotto served with a grilled duck breast. Just add 1/4 to 1/3 cup to the beetroot mix, it gives it another dimension and adds complexity. This will serve 2 – 3 people. Bring a large pot of water to the boil. Shell prawns and cut into 3 pieces. Each piece should be slightly bigger than the orecchiette. The aim is after cooking, the pasta and prawns will be roughly the same size. Salt your cooking water and add a little olive oil. When boiling, throw in your pasta and stir. Just before it is ready, about 10 minutes; take out ¼ cup of the cooking water and add the saffron to it. Drain pasta in colander. Put about 3 tbsp olive oil into the pot, heat and throw in the prawns. Toss over a medium heat and add garlic cooking just a minute or two. Add pasta, saffron water, tomato sauce, lemon and orange juices, and rind. This will take only a minute to come together and the sauce will thicken. Season with sea salt and pepper and drizzle with olive oil as you serve. Preheat oven to 180C. Slice tomatoes in half, lay on baking tray, scatter with thyme sprigs, sea salt, pepper, and drizzle with olive oil. Cut onions and fennel into thick slices and lay on another tray. Scatter with thyme sprigs, sea salt, pepper, and drizzle with olive oil. Put both trays in the oven, tomato tray in top half of oven, onions and fennel below it. Roast for 1 hour, turning the onions and fennel over after ½ hour. After 1 hour the onions and fennel should be cooked and nicely caramelised, if so take them out and let cool. The tomatoes will need another ½ hour, take them out, and let cool. Discard thyme sprigs. Melt the butter in a medium saucepan over a low heat and then add the flour. Stir with a wooden spoon until the mixture starts to bubble and lighten in colour. Continue to cook for a minute or two, but don’t allow the mixture to brown. Now, switch to a hand whisk and add your cold milk, little by little, until it has all been absorbed and the mixture starts to thicken. Continue to cook for several minutes over a low heat, whisking constantly, until the béchamel is thick and smooth. Set aside. I have used David Lebovitz’s recipe, but used less garlic, and added a little orange oil to the mix. Be sure to use fresh pistachios, I store mine in the fridge after buying them. I also made this in my food processor, just be sure to stop the machine a few times to scrape down the sides to make sure everything is being incorporated properly. Spread pistachios on a small baking sheet and put in the oven for 3 minutes, just enough to warm them through. Remove from the oven and let cool for a few minutes, and then put into the bowl of a food processor with the minced garlic. Pulse-chop until pistachios are in little pieces. Scrape down the sides, and slowly add the water, and then 90ml of the extra virgin olive oil. Add a splash of brandy, the orange zest, salt, and the orange oil if you have it. Taste, and add the rest of the extra virgin olive oil if it seems too thick. Set aside for the flavours to mellow for a couple of hours, or in the fridge for up to 1 week. Now, bring a large pot of salted water to the boil and place a large bowl of iced water next to the stove. When the water is boiling, add a few drops of olive oil to it to stop the pasta from sticking. Cook the pasta rectangles for 2 minutes, lift out with a slotted spoon and immerse in cold water, then lay on tea towels to dry. Preheat oven to 180C and grease your baking dish with 1tbsp of butter, then smear with 3tbsp of the béchamel sauce and lay a sheet of the pasta on top. Spread 1/3 of the remaining béchamel sauce on to the pasta, then spread the caramelised onions on top, followed by half of the tomatoes. Dollop spoonfuls of ricotta and the aillade around the tomatoes, sprinkle with Parmesan, and top with another sheet of pasta. Repeat now with the fennel, tomatoes, ricotta, aillade and parmesan, and top with the remaining sheet of pasta. Spread the last of the béchamel sauce on top, sprinkle with Parmesan to cover, and dot with 2tbsp of butter. Bake for 30-45 minutes, or until the surface is golden and bubbling. Remove from the oven and let rest for 10 minutes before serving. 2 thick slices day old ciabatta loaf, torn into small pieces. First make the pangrattato. Preheat the oven to 180C, put the butter onto a baking sheet and place in the oven to melt. When melted, add the olive oil and the bread, and toss until coated in the butter and oil. Place in the oven and bake for about 10 minutes, or until golden brown and crunchy. Take out and drain on kitchen paper. Bring a large pot of salted water to the boil, and start to make the sauce. Heat a medium sized fry pan over low heat. Add the olive oil, the finely sliced garlic flower stems, and the anchovies, and cook gently for a few minutes. You want them to soften, not fry. After about 5 minutes, add the chillies and black pepper. Remove from the heat, add the lemon zest, juice and parsley. You may also need a little more extra virgin olive oil. Cook the spaghettini in boiling salted water until done. Drain, keeping back a little of the pasta cooking water, and toss with the sauce until each strand is coated, adding 3tbsp of the water and half the torn garlic flowers. Finally, mix in the pangratttato, pile into warm bowls, and scatter the rest of the flowers on top. I can’t help myself, I always drizzle with a little more olive oil, a squeeze of lemon, and dust with freshly grated Parmesan. Enjoy.